Rakesh Singh (Emraan Hashmi) grew up in Jhansi. The way out of the small town, and into a dignified salaried life, was becoming a doctor. This meant clearing a joint entrance exam. He tried thrice and failed. His elder brother, on the other hand, became a surgeon in Johns Hopkins University. But Rakesh turned the very system that slotted him as a failure on its head. For a handsome amount of cash, he began selling seats in engineering colleges to mediocre students who, like him, didn’t find answers or solace in rotational mechanics. Why Cheat India (2019) Rakesh Singh (Emraan Hashmi) grew up in Jhansi. The way out of the small town, and into a dignified salaried life, was becoming a doctor. This meant clearing a joint entrance exam. He tried thrice and failed. His elder brother, on the other hand, became a surgeon in Johns Hopkins University. But Rakesh turned the very system that slotted him as a failure on its head. 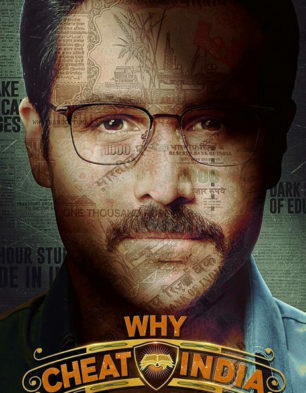 For a handsome amount of cash, he began selling seats in engineering colleges to mediocre students who, like him, didn’t find answers or solace in rotational mechanics..
All Said And Done, Cheat India Is Informatively Entertaining And Emraan Hashmi Makes Sure To Maintain This.. Even After This Movie Ends, You Aren’t Particularly Enlightened About The Conman Who Manipulated The Indian..
What Works For The Film Is The Acting. Emraan And Newbie Shreya Have Done A Well-enough Job And Share Enough.. But Don’t Be Fooled By These Numbers: This Film Is Indifferent To The Plight Of Students. It Sees Them As..
A Couple Of The Acts — Snighadeep Chatterjee As Sattu, The Good Student Turned Bad, And Shreya Dhanawantary..
A Plot Twist In The Last Act Comes As A Surprise, Although Bits Of The Explanation To The Lead Up Are..
Why Cheat India | Emraan Hashmi &..
Why Cheat India Press Conference..